Anna Lea Merritt etching "Portrait of Sir Gilbert Scott"
Medium: etching. 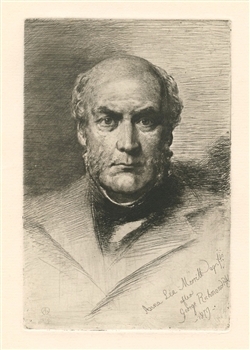 Etched by Anna Lea Merritt after George Richmond. A fine impression on cream laid paper, it was published in 1880 by The American Art Review. Plate size: 7 1/4 x 4 7/8 inches, with good margins. Signed in the plate (not by hand). Considered to be one of Anna Lea Merritt's finest etchings.